Chevrolet Tahoe is the industry’s best-selling full-size SUV. It was comprehensively redesigned for 2007, giving customers the capability expected of a full-size SUV with a sharper, more precise driving feel, more power with improved, segment-leading fuel economy, increased interior refinement and improved quietness. Chevy takes another leap forward in the segment – and the world – for ’08 with the introduction of the Tahoe Hybrid. It features the world’s first production 2-Mode full hybrid propulsion system, which offers a 25-percent overall improvement in fuel economy. Better still, the fuel-saving advantages of the Tahoe Hybrid are balanced with a superior driving experience and uncompromised capability. Indeed, the Tahoe Hybrid offers the utility and capability customers seek in a full-size SUV. The Hybrid can tow up to 6,000 pounds (2,721 kg). To maximize its efficiency, the 6.0L V-8 engine is equipped with GM’s Active Fuel Management™ technology, which switches between four- and eight-cylinder power in certain driving situations. All Tahoe models are built on GM’s full-size SUV platform, which incorporates features such as a fully boxed frame, coil-over-shock front suspension, rack-and-pinion steering and a premium interior that bolsters the vehicle’s comfort, quality and capability. Wide front and rear tracks enhance handling and lower the center of gravity for a more confident road feel. Tahoe is also designed with safety in mind. It delivers a 360-degree safety system of occupant protection and crash-avoidance technology, with features such as standard StabiliTrak stability control system with rollover mitigation technology. For 2008, Tahoe’s list of standard safety features is enhanced with the inclusion of head-curtain side impact air bags on all models. Previously, they were optional on some models. 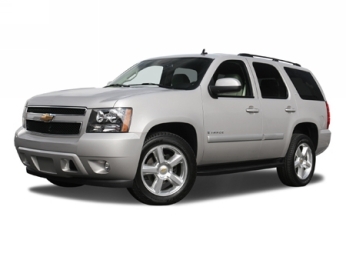 The 2008 Tahoe is available in LS, LT, LTZ and Hybrid models (Hybrid with interim availability), with 2WD and 4WD. Tahoe’s standard powertrain (except base 2WD) includes an efficient 5.3L V-8 with Active Fuel Management technology that seamlessly switches from eight-cylinder to four-cylinder operation to save fuel. Additional changes for ’08 are minor, reflecting customer preferences and enhancing Tahoe’s style. They include a change to a 40/20/40-split bench seat in LS models that provides convenient storage space in the center section; woodgrain trim added to the forward center console and brighter instrument pointers in the gauge cluster. There are also two new exterior colors: Blue Granite and Deep Ruby Metallic. Returning for 2008 is the Tahoe’s popular Z71 Off Road appearance package. This optional package includes the Z71 Off Road suspension with high-pressure, gas-charged monotube shocks, 18-inch on/off-road tires, automatic-locking rear differential, front recovery hooks, a durable skid plate and a high-capacity air cleaner. Large, color-keyed fender flares, an aggressive front fascia, chrome tubular assist steps, chrome door handle centers, chrome mirror caps and chrome grille inserts provide a distinctive appearance. Inside, a brushed metal-look replaces wood grain accents for a more rugged appearance. Also included are leather-appointed bucket seats that are available in solid Ebony, Ebony with Light Titanium inserts and Ebony with Morocco Brown inserts. Also available on Tahoe LTZ models is the Chrome Appearance Package, which includes a stainless steel exhaust tip, chrome recovery hooks and the choice of one of six 20-inch wheel designs. Power articulating running boards are available. They blend smoothly with the vehicle’s design, but automatically move downward and outward when the doors are opened, providing a lower step-in height. The Vortec V-8 powered Tahoe Hybrid is expected to deliver a composite fuel efficiency improvement of 25 percent when combined with Active Fuel Management cylinder deactivation technology. The Tahoe Hybrid has a distinctive look befitting its unique powertrain; it is 10 mm lower in the front and has additional aerodynamic features compared to non-hybrid models. Special features, including prominent hybrid badges and a unique Glacier Gold exterior finish, complete the look. GM, BMW and DaimlerChrysler have co-developed the 2-Mode full hybrid system that will leverage automatic transmission technology and electronic controls in an integrated, powerful and compact system that can be used with both gas and diesel engines. GM’s 2-Mode full hybrid system in transit buses has been established as the starting point for the GM-BMW-DaimlerChrysler collaboration. The design integrates proven automatic transmission technology with a patented hybrid-electric drive system to deliver the world’s first 2-Mode full hybrid. The 2-Mode is patented hybrid technology with two modes optimized for city and highway driving. In the first mode, at low speed and light loads, the vehicle can operate in three ways: electric power only, engine power only or in any combination of engine and electric power. When operating with electric power only, it provides all the fuel savings benefits of a full hybrid system. Leaving the engine shut off for extended periods of time and moving under electric power at low speed is key to reducing fuel consumption in heavy stop and go traffic. The second mode is used primarily at highway speeds. In addition to electric assist, the second mode provides full eight-cylinder engine power when conditions demand it, such as when passing, pulling a trailer or climbing a steep grade. The second mode integrates sophisticated electronic controls, such as Active Fuel Management, cam phasing, and late-intake valve closure, allowing even more efficient engine operation. 2-Mode system innovations allow for more efficient packaging because its compact and powerful electric motors are designed to fit within the approximate space of a conventional automatic transmission – an efficiency advantage compared with today’s typical single-mode systems that rely on much larger electric motors. A sophisticated controller determines when the vehicle should operate in either mode of the 2-Mode drive system. Input from the controller determines the necessary torque for the driving conditions and sends a corresponding command to the engine and electric motors. The engine and electric motors transfer torque to a series of gears in the transmission, which multiply torque similar to a conventional automatic transmission to propel the vehicle. Unlike conventional continuously variable transmissions, however, the 2-Mode full hybrid’s electrically controlled system uses no mechanical belts or bands. Shifts between the two modes are synchronous, which means no engine speed changes are necessary for the mode shift to occur, resulting in ultra smooth accelerations. The 300-volt battery pack provides electric power for the system, and while it is larger than a typical automotive battery, it is designed to fit in the vehicle without compromising passenger space. Special converters located under the vehicle’s hood convert the motors’ AC output to DC current and power conventional 12-volt accessories, such as interior lighting, climate control and the radio. The vehicle’s internal combustion engine provides power to charge the battery pack, so the vehicle doesn’t have to be plugged in to keep the battery pack maintained. Because the architecture can be scaled to fit multiple vehicles and adapted to gasoline or diesel engines, the 2-Mode full hybrid can be applied globally. In Europe, for example, where diesel engines are common in passenger vehicles, it can provide a significant reduction in fuel consumption, which would help automakers meet the region’s ever-stringent carbon dioxide emissions standard. To maximize efficiency, the front of the Chevrolet Tahoe Hybrid is lowered 10 mm compared, which provides additional aerodynamic benefits as well as a smoother and sleeker appearance. The hood and liftgate are made of aluminum to trim weight, and the leading edges of the hood have been streamlined. The Tahoe Hybrid retains Chevy’s trademark dual-port grille with Chevy bowtie, but with a larger intake to accommodate the hybrid powertrain’s higher airflow requirement for cooling. The fascias are tuned at the corners and air dam, and the running boards are flared in front in an effort to guide airflow around the wheel openings. Hybrid badging appears on the C-pillar, on the rear liftgate and on the hitch cover. Other aerodynamic refinements include sharpening of the D-pillar rearward, including the taillamps, a CHMSL appliqué detail spoiler over the rear hatch and a closeout panel under the back of the vehicle to facilitate airflow. Lightweight, aero-efficient wheels with the lowest rolling-resistance tires available for full-size trucks further trim fuel use, and are complemented with a tuned ride to provide the ride and handling performance and attention to detail that customers expect from a totally integrated vehicle. Tahoe features a stiff, fully boxed frame, which reduces vibrations transmitted to the passenger cabin. The strength and accuracy of the frame also enable more precise mounting and tuning of chassis and suspension components, which also helps reduce vibration. Even the tires on the large, 17-inch standard and 20-inch available wheels were designed to reduce noise. Noise-reducing components and materials are used throughout the body structure, including the headliner material, door seals and front-of-dash area. The engine also features a quiet-tuned alternator and an acoustically tuned engine cover that dramatically reduces engine noise heard inside the vehicle. Specific door seals help reduce seal “pull away” at highway speeds, which can cause wind noise. Also, Tahoe’s more slippery shape, thanks to improved aerodynamics, streamlined exterior mirrors and roof rack, and tighter body gap tolerances, makes Tahoe quieter as it slices through the air. Tahoe’s quietness and smoothness are complemented by the Autoride suspension system, which is standard on LTZ. This segment-exclusive bi-state, real-time damping system provides an extremely refined ride with greatly reduced body motion. The system consists of a semi-active, two-position damping control system that responds in real time to road and driving conditions, based on body and wheel motion sensors. Tahoe’s quietness and smoothness are complemented by its full-size SUV capabilities. Tahoe 4WD models offer up to 8,200 pounds (3,720 kg) of towing capability. Features such as articulated running boards and the popular Z71 Off Road appearance package are available, enhancing the Tahoe’s levels of convenience and personalization. A small-block V-8 family powers the Tahoe lineup. Fuel-saving Active Fuel Managementtechnology also enables better fuel economy. When combined with other vehicle-wide features, including improved aerodynamics, the small-block V-8 helps give the Tahoe the segment’s best fuel economy. A Vortec 5.3L V-8 with 320 horsepower (239 kW)* and 340 lb.-ft. of torque (461 Nm)* offering Active Fuel Management technology and E85 capability is standard in 4WD models and Hybrid. E85 is a renewable fuel made of 85 percent ethanol and 15 percent gasoline. GM vehicles with E85 capability can run on 100 percent gasoline or on E85 or any combination of the two. A Vortec 4.8L V-8 is standard on Tahoe 2WD base models. Tahoe’s steeply raked windshield and smoother roofline improve its aerodynamics, resulting in a best-in-class 0.363 cd and enhanced highway fuel economy. Additional contributors to efficiency include a lower, wider front air dam, tighter tolerances and gaps between the fascias, lamps and grille openings, and improved front-end sealing that nearly eliminates air leak paths. These features contribute to enhanced fuel economy and improved driving quietness, compared to previous models. Redesigned in ’07, the Tahoe’s design is lean and agile looking, with large wheels and a wide track enhancing Tahoe’s powerful, capable stance. Sleek aerodynamics also contribute to the look, with a more steeply raked windshield and smoother roofline accentuating the exterior length. Tahoe features the new face of Chevrolet with a large Chevy gold bowtie, centered on a twin-port horizontal grille. The body-colored grille surround is inset with an argent texture or available chrome mesh. Fog lamps and headlamps feature jewel-like optics. The lower fascia, incorporating the front license plate holder and integrated recovery hooks, is aggressively styled with a skid plate look that enhances Tahoe’s rugged, off-road appearance. Tahoe’s front end reflects its sporty, outdoor character. It includes the fast-rake windshield; a bulging power dome hood; a prominent new fender design with integrated wheel flares; a distinctive new grille and headlamps; and a full-wrap fascia. The wraparound fascia, which eliminates the conventional bumper-to-body gap, is one of the numerous attributes that give the Tahoe a more refined look, while also enhancing aerodynamics. Also complementing Tahoe’s sporty appearance is an assortment of 17-inch and 20-inch wheels. Seventeen-inch wheels and tires are standard, with 20-inch factory-installed wheels available (standard on LTZ). The larger wheels give the vehicle a more confident stance. Tahoe also offers power articulated running boards. They blend smoothly with the vehicle’s design, but automatically move downward and outward when the doors are opened, providing a lower step-in height. Refinements throughout Tahoe’s spacious interior create an environment that exudes quality and precision, as well as comfort. A two-tone color scheme offers softer and low-gloss materials for the instrument panel and other trim pieces. Additional details include LED backlighting for the instruments and chrome accents on instruments and vents. Flush-mounted accessories and controls, such as the climate control/radio center stack, create a seamless, “single unit” appearance. Also, there are almost no exposed metal hardware or latches, as all models feature enclosing “close-outs” around the seat bottoms and door sill trim plates. The Tahoe features a 360-degree perimeter safety system of occupant protection and crash avoidance technologies. Standard features include head curtain side air bags with rollover protection for all seating rows and front-seat safety belt pretensioners that are linked to the vehicle's sensing system to provide segment-exclusive deployment in rear-end crashes. The roof-mounted head curtain air bags include design features that provide increased rollover protection and occupant containment. These head curtain side air bags stay inflated longer than air bags developed only for side impacts, since rollover incidents can last longer. The deployment duration and other design features of the air bags combine to provide increased occupant protection and the ability to help keep occupants inside the vehicle. Sensors located at the front of the vehicle, in the side doors and within the occupant compartment provide increased and more immediate crash detection. Crash avoidance is bolstered through enhanced design and driver control dynamics, such as wider front and rear tracks, as well as more responsive suspensions – including a new coil-over-shock front suspension design and new rack-and-pinion steering. The vehicles are built on a stronger and stiffer, fully boxed frame that contributes to enhanced crash energy management. The front frame section has been designed to optimize crush progression, resulting in improved energy absorption efficiency. The improved crush performance, enabled by hydroformed frame rails and efficient chassis component packaging, also comprehends design provisions for improved vehicle-to-vehicle compatibility in the event of a frontal impact with a smaller vehicle. All models come with the OnStar system. The system includes the General Motors Advanced Automatic Crash Notification (AACN) system, making crash data available to emergency services to potentially dispatch the appropriate life-saving personnel and equipment to crash scenes faster. If the vehicle is in a crash that activates an air bag, the OnStar system automatically notifies an OnStar advisor, who will check on the occupants or summon emergency help if necessary. OnStar also can assist authorities in locating a vehicle if it is reported stolen (ability to locate stolen vehicles varies with conditions). All ’08 Tahoe LT and LTZ models feature OnStar’s Directions & Connections package, which includes Turn-By-Turn Navigation.